Where do you imagine EPA administrator Scott Pruitt goes home at night? A concrete basement filled with finger paintings of Charles and David Koch? A remote forest cottage haunted by the demanding ghost of Rumpelstiltskin? A sweat lodge? A sensible two-bedroom in Arlington? Wrong! 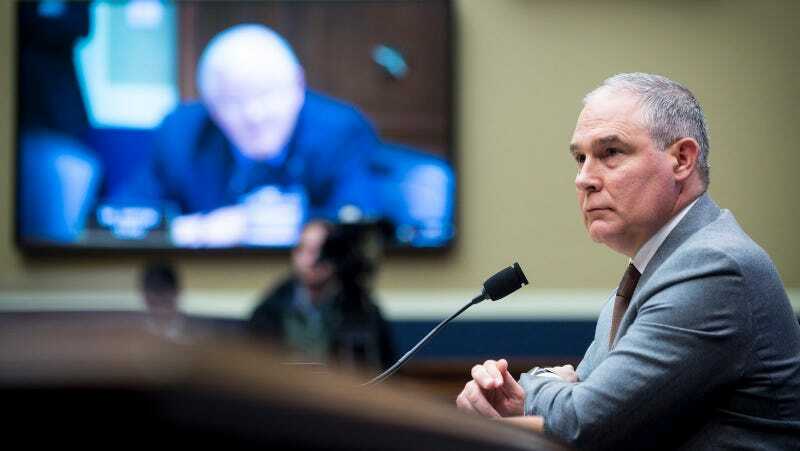 For most of his first year in D.C., ABC News reports, Scott Pruitt lived in a townhouse that is co-owned by the wife of energy lobbyist J. Steven Hart. Mr. Hart is the chairman and CEO of Williams and Jensen, a firm that reported more than $16 million in federal lobbying income in 2017, according to the Center for Responsive Politics. Among his many clients are the NRA and Cheniere Energy Inc., which reported paying Hart’s firm $80,000 a year. Well, “What happens in Morocco...”, as the old Environmental Protection Agency saying goes!